Poni has a vast majority of commands available for you and staff to use! With a total of 63 commands available for you to use, you're sure to need to know how to use them! Poni has commands that range from fun commands to crucial raid stopping commands! To ensure that a command will work, we first need to go ahead and run setup and config Poni. This will setup and configure Poni for your server! We are now ready to start learning how to use commands. Finding out if a command is available to you is easy! All you need to do is run YourPrefixhelp, replacing YourPrefix with - or a custom prefix if you have set one! Poni will then Direct Message you with information concerning commands available for you to use! Using commands can be the tricky bit if you are unsure how a command works! Finding out how a command works can also be tricky if you have to wait for a Member of Support to help you out! So here's how each command works. For each command, replace - with your own prefix. Running this will display the total message count of a user or you! Removing @user will display your message count! Running this will agree to the Server Rules, and will give you the member role set in the config. Running this will assign you a role set by Staff which is later explained on how to setup! If the role name has an emoji in, be sure to put the role name in Speech Marks, for example -assign ":desktop: Windows User". Running this will remove the role you assigned yourself before. Once again, setting this up will be explained later. If the role name has an emoji in, be sure to put the role name in Speech Marks, for example -remove ":desktop: Windows User". Running this will allow a user to run -assign rolename and recieve the role you set. You need to make sure the role is mentionable and is BELOW the Poni role. Running this will disallow a user from assigning the role to themselves. You need to make sure the role is mentionable before attempting to remove it. Running this will return the mentioned users avatar, removing the mentioned user will return your avatar! Running this will ask if you would like to ban a user. If no reason is provided it will return "No reason provided" to the user upon Notification of their ban in Direct Messages. Running this will allow you to calculate two numbers together, replacing (x, /, +, -) with what you want to do! Running this will display a random cat image in an embed format! Running this will configure Poni for your server! Running this will create a Custom Command for your server, changing commandname for what you want to come after the prefix, and the commandoutput to be what is outputted. Running this will delete a Custom Command created in your server, changing commandname for what you set before. Running this will display all Custom Commands in your server set using -create_command. Running this will decide between the two choices inputted. If one of your choices include more than one word, put it inside speech marks, For Example: ``-decide "Novus Community" "Novus Bot Support". Running this will display a random dog image in an embed format! Running this will display your embed in a text format. Running this will begin a sequence of questions. After answering with the color of choice a new question will appear, asking you if you want to have a custom image, respond with a link to your custom image or just respond with no to display your avatar. Success! We've successfully created a Rich Embed which should look similar to this. Running this will output either Heads or Tails like a virtual coin. Running this command will output information about a Fortnite User on the specific platform, defined by XBL for Xbox, PSN for PlayStation and PC for PC. Running this will initiate a Giveaway for Users to join in with the ID specified in the embed. Running this will allow you to join a Giveaway created by Staff of the Server. Running this will allow you to end a Giveaway, and randomly choose a winner. Running this will allow you to ban users by ID, not in the server. You can ban multiple IDs, by placing a space in between each ID. Running this provides every command available for use in Poni, and a brief description on them. Running this provides current information about Poni. Running this provides an invite to Poni, in which you can invite Poni to your server. Running this removes a user from the server but not permanantly, not providing a reason will make the reason "No reason provided"
Running this provides the Top 5 highest activity in your server. Running this creates a virtual marriage in Discord. Running this ends your marriage with someone. Running this provides a merit to the user with the reason specified, not including a reason will make the reason "No reason provided". Running this provides the merits for a user, not providing a user will return the merits for you. Running this removes a merit from the user by the Merit ID. Running this will temporarily mute the user specified. Running this will remove the mute from the user specified. Running this will remove an amount of message specified. The amount must be 100 or lower. Running this provides information about an osu! player. Running this pastes one of the following pastes. Running this returns the current ping of the bot. Running this returns the total points across all servers, determined by strikes, merits and message count. Removing @user will display your points. Running this will provide a thumbs up, thumbs down poll for the question defined. Running this will end the Poll created by it's ID. 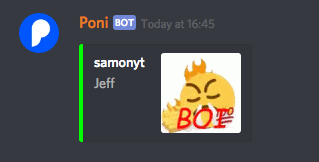 Running this will provide information about a user on Discord. Removing the @user will provide your profile. Running this will provide a yes/no answer to your question! Running this will provide a "rapname" as if you're a SoundCloud artist. Running this will create a "social experiment" making the user think they're banned! Running this will provide a number from 1-6 from the virtual die. Running this will output information about the Server. Running this will initiate the setup for Poni. Check out the Setup Documentation. Running this will provide Shard information for your server. Running this will "ship" two users together. Running this will spin a virtual slot machine. Running this will provide information about a Steam User by their VanityID (their URL). Running this will strike a user for the reason defined, not including a reason will make the reason "No reason provided". Running this will provide the strikes for the user tagged. Not tagging a user will provide your strikes. Running this will remove a strike by it's StrikeID. Running this will provide information about any URL redirections (if any). Running this will provide the Trusted role set in the config. Running this will remove the Trusted role set in the config. Running this will provide the current weather for the location. Running this will provide the upcoming forecast from the location.